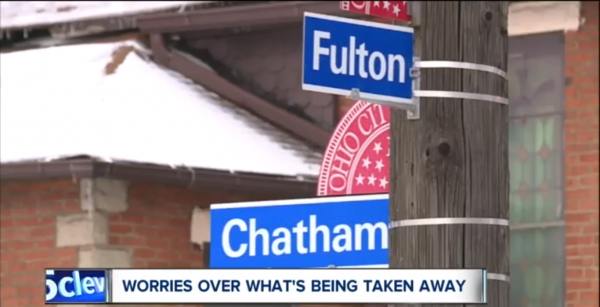 News 5 Cleveland reported about the planned changes to Fulton Road, and the potential impact it could have on the safety of the road. Councilman Kerry McCormack as well as residents are concerned about the removal of 3 street lights for good reason. Please read our first update below, and sign on to our letter recommending changes to the design of the street. 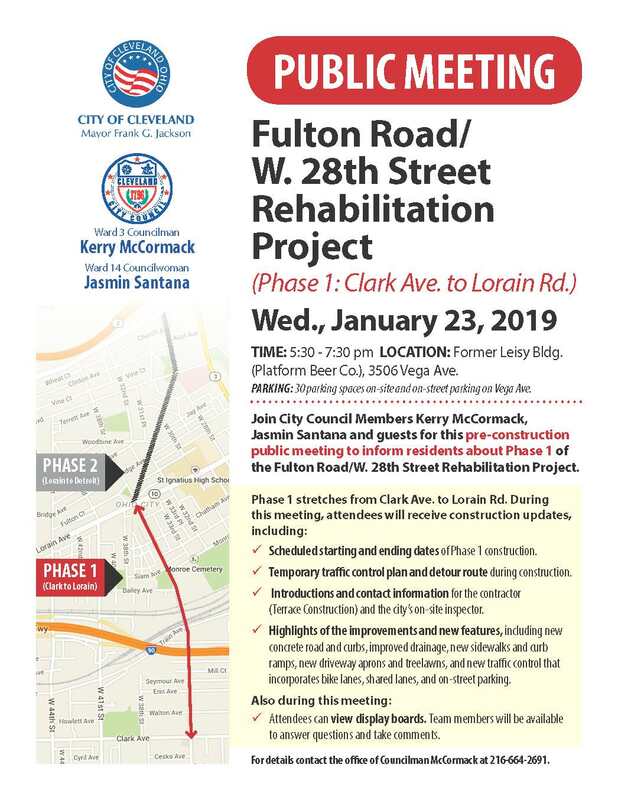 On January 23rd, the City of Cleveland held the final Public Meeting for Phase 1 of the reconstruction of Fulton Road. We were pleased to see the improvements in the continuity of the bike lanes from Clark Ave. to Monroe Ave. – as the original plan toggled back and forth between bike lanes and sharrows. The bike lanes in the design are very wide, with no buffers or bollards. A 6 foot lane with the additional space used for painted buffers & bollards would create a safer space for riders, and prevent aggressive drivers from entering the bike lane. There is a bike lane buffer designed into the bridge. This should be bollard protected as well, to prevent aggressive drivers using the space to pass vehicles over the crest – and encountering riders hidden by the incline. On-street parking remains between Monroe Ave. and Lorain Ave. with sharrows. If this parking is to remain in place of bike lanes, then curb extensions should be used at intersections and perhaps mid-block to keep drivers in-check when no parked cars are present. Otherwise, the problems that exist on Fulton today in this section will remain. If they cannot be engineered into the permanent concrete design of the roadway, the could be cheaply implemented with painted extensions and bollards. Due to 3 traffic lights being removed and the speed remaining at 35mph, we would like to see the addition of traffic calming elements along the entire corridor to deter speeding and ensure pedestrians can cross the street safely at intersections where no signals exist. Join us in expressing the need for these changes by signing on to the letter below. We will share the signed letters with local council members and city leadership in order to make Fulton Road safe for all users. 1. Adding a painted buffer and plastic posts along the bike lane from Clark to Monroe to create a protected bike lane and to prevent motorists from driving/passing in the bike lane. 2. Adding curb extensions and plastic posts at intersections where there will be parking (from Monroe to Lorain) to prevent motorists from driving/passing in the parking lane. 3. Due to 3 traffic lights being removed and the speed remaining at 35mph, we would like to see the addition traffic calming elements along the entire corridor to deter speeding and ensure pedestrians can cross the street safely at intersections where no signal exists. These additions will help make Fulton Road a complete street that serves all users in a safe, equitable way. It’s time to provide final feedback on the first phase of the reconstruction of Fulton Road. This phase will reconstruct Fulton Road from Clark Avenue north to Lorain Avenue, and work is due to start as soon as February. This meeting is hosted by the City of Cleveland, Ward 3 Councilman Kerry McCormack, Ward 14 Councilwoman Jasmin Santana, Metro West Community Development Organization, and Ohio City Incorporated. There are a lot of crashes on Fulton Road. In fact, from 2015-2017 there were over 130 crashes. See the map below. We need a Fulton Road that is safe and connects to the growing bike network in Cleveland. This corridor connects to the Lakefront Bikeway and to the future Lorain Avenue protected bike lane. Parallel streets W. 41st and 44th have unprotected bike lanes the are notoriously dangerous to ride in due to motorists driving in them. This is our chance to connect the Stockyards Neighborhood to the lakefront. We haven’t seen the updated design for Fulton Road (the design shared at the last meeting had a mix of unconnected bike lanes and sharrows, creating an unsafe place for people to bike on this 35mph street.) Join us at the Fulton Road phase 1 public meeting on January 23rd and let’s see if the plan is to make Fulton Road a safe, connected street for people who bike. For more information, contact Ashley Shaw at ashaw@ohiocity.org. If you’re interested OCI is organizing a group walk to the meeting. Meet in front of Planet Fitness (3333 Lorain Avenue) at 5:15pm. They will walk back to Ohio City as a group following the meeting. Note: There will be a second public meeting for the 2nd phase of the project from Lorain Ave to Detroit Ave. Stay tuned for more information on this section.